2018 Hackaday Prize Achievement: Your project took some serious reverse engineering. This project was created on 04/16/2018 and last updated 21 days ago. Designing and building an inexpensive spectrometer just got easier with AMS&apos; new 3-chip AS7265X smart spectral sensor; once this is working, building a modern tricorder should be a piece of cake! AMS makes several interesting sensors including the CCS811 air quality sensor which I use in my STM32 Sensor Tile project and the AS7262 6-channel light sensor, which appears now in a breakout board that Adafruit has just announced. The AS7262 offers six channels in the visible (430 to 670 nm) with 40 nm FWHM resolution. There is also another similar AMS sensor the AS7263 which offers six channels in the near IR (600 - 870 nm) with 20 nm FWHM resolution. I was thinking of designing a simple spectrometer out of these two by combining them onto one pcb. The problem with this idea is that they both have the same I2C address, so I would have had to use an I2C multiplexer. Then there is the problem of syncing the data conversion and read times to build a proper 12-channel spectrum. These are both manageable problems and I was looking forward to working them out when I discovered, in a way, AMS had already beat me to this idea. It should be no suprise that AMS thought of combining sensors with different filters (this is how they achieve the relatively narrow 20 nm spectral resolution) just as I did. But they did it right, equiping one of the sensors with a master I2C bus to allow management and proper syncing with the other two. Yes, that&apos;s right, in the 3-chip AS7265X set AMS has come up with (AS72651 as master, AS72652 and AS72653 as slaves) there are now 18 individual channels spanning the 410 to 940 nm range with 20 nm FWHM resolution. The full 18 channels can be read out after two conversion cycles (minimum conversion time is 5.6 milliseconds). The sensors can also control indicator leds as well as source leds for illumination to match the spectral response of the sensors. The idea here is that the resultant device is a reflectance spectrometer which will work best when the object under analysis is bathed in light matched to the sensitivity of the (filtered) photodetectors. The chemical makeup of the test object will determine how much of the light is reflected or absorbed, and a catalog of specific spectral responses of known materials can be built up to allow identification of many unknown ones. In the initial design, I have chosen one broad spectrum 5700 K 90 CRI led and two IR leds (one peaked at 850 nm and one peaked at 940 nm). The idea is to gather an 18-channel spectrum using the broad band illumination, then again using one or both IR sources. The latter will provide the signatures needed to distinguish and identify organic compounds and analyze plant and animal matter, whether in the wild, in the garden, or on the dining table. The pcb itself has been designed to be as compact (18 x 19 mm) as possible while remaining easy to assemble, aesthetically pleasing, and functional. I still have several problems to solve. The master (AS72651) requires that firmware is loaded onto the connected SPI flash memory. I am still not sure where to get the firmware, how to load it, and even whether this needs to be done through the SPI port (which I did not expose to the board edge) or via I2C. Also, I do not know if the master bus requires pullup resistors (this is required on the EM7180 master bus, but not on the MPU9250 bus, so I added them to be sure). I also can&apos;t find the three chip set for sale anywhere. Lastly, I think the reference design in the AS72651 data sheet has several obvious errors but it is hard to be sure. I have sent AMS e-mail with my questions and thoughts about the reference circuit but haven&apos;t heard a peep yet. I ordered the AS7265X evaluation kit ($130) so I will at least have a working version to examine and start the Arduino sketch development. This promises to be a fun and very useful project which should result in a tiny 18-channel spectrometer capable of forming the basis for my (or anyone else&apos;s) modern tricorder. First some housekeeping. I have a supply of these Compact AS7265X Spectrometers for sale now at Tindie and I expect to keep these in stock as long as there is demand. Thanks to all for the support! Quite a bit different, eight (in bold) of eighteen channels were assigned the wrong frequency! This helps explain some of the mysterious results I was getting before, where the spectrometer seemed to be having trouble detecting a simple copper edge. So, let&apos;s try that again with the correct(ed) frequency bins. Here are the spectra from aluminum foil and with the same 0.999 copper coin on top of the aluminum foil under the spectrometer and both illuminated with the 5700 K CRI 90 white led at 50 mA, at 16 x gain, and at 100 ms integration time. The spectra were averaged over about 30 seconds and then captured to a spreadsheet. The spectrometer was held by a "third-hand" pointed down with the targets on the table under the spectrometer. I made an effort not to disturb the device geometry between the two runs, but otherwise I took no great pains in order to simulate what one might expect from more or less casual use. You can see that there is a fair amount of variation from channel to channel (for example, 585 nm to 610 nm). I don&apos;t think this is all due to the variation in the reflected light but rather due also to the variation of the sensitivity of the individual channels. This means the spectra measured are really only meaningful when compared to a reference. In this case, aluminum (even aluminum foil) is a pretty good reflector so makes an adequate standard for this demonstration. But teflon is supposed to be even better for reflectometry since it reflects the same at nearly all visible wavelengths. and it looks recognizable now. There is low reflectivity below the edge (400 - 500 nm), a 2x rise over ~100 nm that represents the absorption edge, and a more or less constant or gently rising plateau above the edge. There is still a bit of jitter, likely meaning we need to average the spectra further and/or increase the led current from 50 mA to maybe 100 mA, etc. But the results are no longer unintelligible. The spectrometer is behaving now as I expect it should and it is time to revisit some of the older experiments to see if we can distinguish silver, gold, and copper metal from each other (material identification) and see what fruit looks like at different stages of ripeness, etc. I was able to put together six spectrometers for sale at Tindie before I ran out of AS72653 ICs, which have been hard to come by. Arrow Electronics finally got some supply today and I ordered 100 of each of the AS7265X (X = 1, 2, 3) 6-channel spectrometers, so Tindie sales should begin again before the end of the month. I think I will discontinue the all-in-a-row version of the board and start producing (and continue testing) the latest design which is smaller, a little simpler to assemble, and arranges the spectrometer ICs in the same kind of tri-foil pattern used by AMS in their evaluation board; this just makes the most sense to me since then each of the three is treated the same, has the same optical path from the target object, sees the same illumination from the white led, etc. Latest design iteration of the "Compact, $25 Spectrometer". Left is board bottom, right board top. The 3V3 and GND silkscreen labels are mistakenly swapped on the back (since corrected and submitted to OSH Park as v.03a). The green indicator led is the small component on the front top left. The two 0603 led footprints for source leds 1 and 3 are left unpopulated in case the user wants to add a particular frequency source, otherwise by default the 5700 K 90 CRI white led at the center (source led 2) provides the illumination. Switching between I2C mode (default) and UART mode is done by cutting the thin trace on the back solder jumper (between the top two pads) and soldering together the bottom two pads. The 1 MByte SPI NOR flash comes loaded with the appropriate firmware to make the spectrometer work, but the user can also upgrade with the latest firmware if and when this becomes available. The spectrometer is smaller than a US Nickel (five cent coin), meeting the size goal of the project. The total cost to produce the board turns out to be less than $20 meeting the cost goal of the project. Of course, I have to sell the assembled and tested spectrometers on Tindie for more than the cost. But the interested maker can order the pcbs from OSH Park and the components from their favorite electronics retailer and assemble one or more of their own to save money. I consider the design phase of the project complete. This project has been a lot of fun as well as technically challenging and satisfying. And while the results of my experiments to date using the spectrometer have not been wholly satisfactory, my hope is that using the production AS7265X ICs and the new arrangement of same will produce better results. The final device is definitely more than a toy. Whether it can rise to the level of scientific instrument or be used to discriminate between and identify different materials, etc, as shown in the AMS "tricorder" video, remains to be demonstrated. Since I am waiting for AS72653 to show up at the usual retail sites so I can assemble some more of the "production" version of the spectrometer I decided to take a look at a variant design. I noticed that both the original and new AMS AS7265X evaluation boards arrange the three 6-channel sensors in a trifoil pattern. This seems like a good idea to both equalize the distance to the target object and light source and to minimize this distance. So this is what I tried to do. I redesigned the AS7265X spectrometer to place the sensors in a close trifoil pattern. The board is smaller (0.70 x 0.70 inch) than the original production version (0.71 x 0.76 inch) and is actually quite a bit smaller in area because of the rounded edge. I replaced the switch to toggle between I2C and UART modes with a solder jumper, since this is cheaper and in my experience one uses one or the other and doesn&apos;t jump around from one to the other. I also got rid of the IR led footprint. This is not because the IR led is not useful, it is. It&apos;s just that at ~$5 the cost of the IR led is just too much to fit within the "inexpensive" spirit of this project. I kept the interface pins along a single edge and got rid of the 0.1-inch mounting holes which I never used. I found that soldering 22-gauge hook-up wire to the board in a heat-shrunk bundle provides a nice stiff cable with which to hold the spectrometer. Any additional mounting can be done by using a 3D printed frame around the edge or something similar. The distance to the three sensor ports from the center of the board is a constant 0.18 inch (~5 mm) and the broad-band led is right in the center. So the target will be well illuminated and each sensor will "see" the same reflected light. This is as close to ideal geometry as I think it is possible to get with three separate 6-channel sensors and I hope that I will obtain even better results with this set up. I should get the boards back from OSH Park in a couple of weeks for testing. Now that the spectrometer design is basically complete (I might replace the switch with a solder jumper to lower cost) and the spectrometer functions (I get 18 channels of data) I want to learn how to get the most out of it---along the way to answering the question: What is it good for? Breadboard with spectrometer, target (coin of 0.999 pure copper), and cardboard box to place over everything when accumulating data all sit on top of the white teflon sheet. You can see the rectangular piece of aluminum foil (a bit bigger than the breadboard) just under the copper coin and teflon sheet. Copper isn&apos;t plotted but it would look a lot like gold except shifted to the right by ~100 nm. That is, like all good metallic conductors there should be a reflectivity edge, in the case of copper at ~600 nm. Reflectivity peaks at ~700 nm and then trails off slowly at higher frequencies. I measured each spectrum, three reference spectra and three spectra from the copper coin, separately and with a pause in between where I removed the protective box, rearranged the coin or slightly moved the breadboard, etc. The idea was to assess reproducibility of the measurements and sensitivity to small perturbations. I arbitrarily chose reference spectrum 1 as my reference and I am plotting the ratios of all six spectra relative to reference spectrum 1 above. The reference spectra are identical within the width of the symbols used to mark the data. This shows that at least the spectrometer is measuring the same thing from the teflon + aluminum foil reference material each time. Next, the copper spectra show ratios above one for almost all of the channels because the coin is partially mirrored and should reflect a lot more light at most wavelengths that the diffusely-reflecting teflon sheet. There is relatively low reflectance between 410 and 535 nm as expected, and a strong edge at ~580 nm, also as expected. And the spectrum tails off slowly above 800 nm also as expected. What is not expected is the broad dip at 700 nm where there should be a broad peak! Is it possible this is due to a geometric effect of light at these frequencies being unable to get to the photodetectors? This is why I repeated the experiment three times and adjusted the spectrometer/target each time. If there was some subtle alignment issue this would show up as a more wild variation; these three copper spectra are remarkable consistent and reproducible. Also, I was able to buy some of the AS72651 and AS72652 ICs so these are the first boards that have all three of the actual AS7265X ICs: AS72651, AS72652, and AS72653. The previous designs used AS7263 for the AS72651 IC and AS7266 for the AS72652 IC. I bought the AS7263 and AS7266 directly from AMS and these are supposed to be identical to the AS72651 and AS72652, respectively. But probably pre-production variants or something. Anyway, these three boards use the "proper" or more likely "production" versions of the AS7265X chip set. Everything works as expected. The switch I added to the back changes the mode from UART to I2C; in the former case SDA (RX) and SCL (TX) serve as the UART port. The fact that these have 4K7 pullups doesn&apos;t seem to impede the serial UART data flow. I prefer I2C but it is nice to have the option at the flick of a switch. I suppose a solder jumper would have done as well and saved a bit of BOM cost. I should be possible for the user to use a soldering iron to add 0603 leds of his/her choice for the other two source leds. I like having the broad-band IR source led (the bluish square thingy) but this adds significanlty (~$5) to the BOM cost. I think the spectrometer works well-enough with only the broad-band white source led (smaller yellowish thingy) for many applications, so I am kind of on the fence about the benefit of having the IR led too. The total cost ended up being about $21 without the IR led and about $26 with. So this meets the goal of a "Compact, $25 Spectrometer". I listed the final design version (v.02c) of the AS7265X spectrometer as a product on Tindie for $49.95 with the option of adding the broad-band IR led for $10 extra. Considering I will assemble these by hand for a while to test demand, this is still a bargain. But for the cost conscious and/or those that want an assembly challenge, the design files and BOM are open source. I will post the final design and BOM on the project page. Just a brief note on calibration. In addition to the calibration plate I designed (which has not been terribly useful) there is this note on calibration using a CFL (mercury vapor light) from the PublicLab.org site, who sell their own inexpensive (albeit much larger) spectrometer for hobbyists. Calibration is the key to getting sensible results from any spectrometer, and the difficulty in obtaining known spectra for assessing the capabilities of these $25 Spectrometers has made it difficult for me to judge how well I can trust the various spectra I have been able to generate with the devices to date. I was able to verify that the spectra using the broad-band IR led source and a standard reflective mirror looked a lot like the one in the IR led data sheet. I looked at maybe using sources available from spectrascope suppliers but these tend to be quite expensive. But I would really like an inexpensive calibration method using a source with well-defined/known peaks within the 410 - 940 nm range and this CFL method looks like it just might fill the bill. What&apos;s the point of having a new toy if you don&apos;t play with it? What color is the apple? Banana? Well, I see yellow and green in both, and a bit of red in the apple. What color is my palm? It is somewhat apple-like, but not green ;> What does the spectrometer say? I am plotting the spectrum measured from each object at 16x gain, 100 ms integration time, and 25 mA for both white and IR broadband source current. The spectra are normalized by the spectrum measured under the same conditions for the vanity mirror as reference. I expected the spectra to be less than one (less reflective than a silvered mirror) but I didn&apos;t control the distance from the spectrometer to the objects very well; hard to do with curved surfaces in general. Maybe my palm is green! The peak at 535 nm dominates for all three objects. None have a significant blue component and above 600 nm the banana, somewhat surprisingly, has the flattest spectrum with the highest reflectivity. I am not quite sure what to make of this. Are the apparent color differences we see with our eyes in the objects above really due to small, relative differences between similar spectra? What happens when we use obviously different objects, like the colored paper above? I repeated the same experiment (with the same settings) as above but this time I took more pains to keep the distance between the spectrometer and objects the same by leaning the paper targets agains the mirror surface and restarting the sketch to grab a new spectrum. It was not possible to keep the paper targets completely flat nor in the exact same position, still I was surprised that in some cases I measured twice the light (twice the calibrated intensity anyway) reflected from the paper target than from the silvered mirror! Well... this is sort of psychodelic, flourescent colored paper. I wonder if the dyes that give the paper these colors are really flourescing under the broad-band illumination? This wouldn&apos;t be too surprising given the very strong deep blue (410 nm) component of the source light. Do the spectra make sense? OK, the orange paper target reflectance has large components at 535 and 645 nm that the red and pink targets do not. Pink and red target paper reflectivity are almost identical below 700 nm except that the pink paper target reflects a bit more blue (435 nm) and a bit less orange (585 nm) color. Is this enough to cause the apparent color difference between this red and pink paper? Now that everything works, I am in the process of refining the design to optimize utility. I got the latest iteration (v.02b) back from OSH Park and built one. I added 2.54-mm diameter mounting holes at the bottom. I put all of the IO on one side to make it easier to solder a wire bundle or add a connector. I added a footprint for OSRAM&apos;s SFH4735 broad-band IR led. And I added what I thought was a switch to more easily go from I2C to UART mode but the SPVM110100 I selected is really a tactile button, so in the next revision (v.02c, I hope the last) I replaced it with my old standby the SSAJ110100 mounted on the back of the board. In fact, I had to remove the pesky SPVM "button" since I also got the footprint wrong and it was shorting the board! And, since I ran out of the MX25L4006E 4 Mbit SPI NOR flash I was using I switched to the W25Q80BLUX1G 8 Mbit SPI NOR flash with same 2 mm x 3 mm USON footprint, of which I have an abundance. I moved the (green) indicator led to just under the SPI flash; this is useful for indicating data ready interrupts when using the spectrometer. I kept the two 0630 footprints on the board, and kept them unpopulated, in case I (or users in general) want to add a specific light frequency (like UV or IR, for example) as an additional source. with a convenient blue glow (peak at 440 nm) to aid illumination (since the broad band IR above 700 nm can&apos;t be seen by humans). This is a great idea, but the problem is the IR is only significant when the current is cranked up pretty high (350 mA in the output spectrum above). My little Dragonfly has an output maximum of 150 mA. But the AS7265X maximum source led current is only 100 mA anyway. Let&apos;s see what we get. The above is using both the broad-band Luxeon-Z-ES 5700 K 90 CRI led and the OSRAM SFH4735 at 50 mA output current. These spectra are averages over ten or twenty seconds to eliminate variations due to fluctuating source current and anything else. I really should solder the wires onto the spectrometer, since the j-hooks are a bit dodgy. At 50 mA, the broadband IR (IR50) seems to add a bit to the white light (BB50) source (~10x at 850 and 940nm) above 750 nm, as it should, as well as adding to the blue end of the spectrum. The OSRAM SFH4735 is fairly expensive, and it is not yet clear that it is adding high value; more testing will tell. The IR spectrum looks a lot like the spectrum in the SFH4735 datasheet except that the peak at 440 nm is suppressed. This might have to do with the low current. Looks like the spectra just increase monotonically with increasing led current, so any differences between what I measure and the data sheet spectrum are due to variations from led-to-led, or different sensitivity of the spectrometer at different light frequencies. Well, this is the whole point of using a good reference, and I am assuming the vanity mirror is such a reference (at least it is better than white copy paper). I completed the Arduino sketch faster than I expected. I have everything working except I can&apos;t seem to get the interrupt to work. I will eventually. This makes it easy to average data, plot individual channels or all the channels at once. I might connect a Sharp TFT display and see if I can literally generate spectra but for now I am content to plot the data using a spreadsheet. Aluminum foil, silver, copper, and gold (really 91.67% Au/8.33%Cu) coins. I held the spectrometer about 2 cm from each coin face and captured one set of data for each to the spreadsheet. I normalized the four individual spectra to one (they all had peaks at 610 nm). Next, I haven&apos;t done any kind of subtraction. The data are not raw data but calibrated data, presumably using some sort of calibration coefficients that correct for deviations from a standard set during factory testing. This spectra is the result of using the spectrometer like a hobbyist might; turn it on, point and plot! What can we learn from this first attempt at "material identification"? Well, I really mean looking at spectra from similar things and asking if there is anything about the spectra that might be used to distinguish these materials? I think the answer is yes! Gold and silver have strong signals at 645 nm that the other two metals lack, and a stronger peak at 705 nm than the other two metals. Silver has strong reflectance at 410 and 510 nm that gold lacks. In fact, this accounts for the main difference between gold and silver reflectance and how they appear to our eyes. Silver and aluminum have very similar spectra but silver is bluer and whiter (flatter spectrum). Copper is dominated by the peak at 610 nm, right at the orange/red color boundary. This is reflectivity, which is a little different, but it makes it clear that the AS7265X spectrum should be affected by the spectral distribution of the broad-band source, and needs to be corrected for best comparison. I am not sure what to make of the peaks at ~900 nm, probably a result of very small counts there and not significant. Now the differences in the data are even more distinct. Gold and silver have several strong peaks at 585, 645, and 705 nm. In addition, silver has a broad blue response completely lacking in gold. Copper has a broad peak between 585 and 610 nm, as does aluminum, but aluminun also has significant blue and green components with strong peaks at 435 and 510 nm that copper and gold lack. Aluminum and especially silver have the flattest spectra, meaning they appear the most white. I received the pcbs with the Generation 2 design from OSH Park and finally put one together yesterday. Today I loaded the Generation 2 firmware onto the 4 MByte SPI flash and to my surprise I finally got an I2C ACK and discovered an I2C device at 0x49 just where it ought to be! And below a close up look. I replaced the rgb led with a simple blue one (bottom right corner). Sure enough, before the firmware was loaded it was blinking once a second and after firmware upload to the SPI flash the led stayed on. This is different from the behavior on Generation 1 where the led indicator went off when proper firmware was present. I will assume the "constant on" behavior is normal for Generation 2, but I&apos;ll ask AMS. I also didn&apos;t bother populating the source 1 & 3 leds, partly because the 850 nm led I was using for one of them before never seemed to work, and also because the broad band source (yellow square thing) is bright enough for initial testing and I don&apos;t want to complicate things too much just yet. I am pretty sure version 12 is correct; the zip file I got from AMS was labeled FW_AS7265x_12V0.0. I am not sure what the Patch and Build versions are supposed to be, but at least the results aren&apos;t 0xFF anymore! By the way, I was sent this link today. It is another YouTube video showing a product from LinkSquare that is essentially a spectrometer with nearly the same spectral range as the AS7265X that is able to distinguish between aluminum, silver, gold, copper, and titanium. It does this by measuring the reflectance spectrum and comparing to a library of spectra to identify the likely target. This beautiful device can be yours right now for the low, low price of just $549! I wonder if the $25 AS7265X Spectrometer can do the same? Use the EAGLE design files and BOM to identify which components are which on the pcbs you have ordered from OSH Park. The components on the backside include four 4K7 pullup resistors for the master and slave I2C busses, three 10 K pullups for the reset, interrupt, and I2C select lines, a 100 K resistor for the nCS pullup of, and a 1 uF baypass capacitor for, the W25Q80BLUX1G 1 MByte SPI NOR flash. You can use a traditional reflow oven or low temperature (Chip Quik) solder paste and a hot plate and air gun to solder the components to the pcb. Use a microcontroller with on-board flash or SD card to load the SPI flash of the AS7265X spectrometer with the appropriate firmware (found on the AS7265X github repository). Assemble the three AS7265X smart spectral sensors along with one 100 nF and one 10 uF capacitor for each. There are 10 K resistors for spectral sensors 2 and 3. There is a green led (or any color you would like) for an indicator led and the Luxeon LXZ02 5700 K 90 CRI broad-band white led (or any color spectrum you choose) for source. I had a lot of fun building and coding around your product! ..included a reflectively measurement of copper (Timecode: 3:18). The reflected LED intensity for reference is hard-coded. As a reflector i used a disk from a HDD. Further measurements might follow soon. Thanks for your support last year. Best wishes and have a nice day. Would you mind if I link to this video from the Tindie product page? Hey, sorry for the lack of details. I had too much of them, to put them in the video. Yea, the height / intensity is normalized in all three modes. The right bar shows calculated intensity (µw per cm^2 per IntTime) or % of T/R coefficient. In the top / middle the used dynamic range of the channel with the highest value in % is show underneath the sum of intensity all channels. The optical cable is some old audio SPDIF cable and ends in front of a diffuser, covering the sensor (the diffuser must come out, when probing R & T). It used to have a good transmittance over the used range. The LEDs are between 405 nm and 933 nm. I made reference measurements of all of them with a 1000 line Spectrometer (the range is actually from 396.0 nm up to 933.9 nm. I haven&apos;t checked the intensity, but i have noticed a drift in 2 or 3 channels over time while probing low to very low intensities (610, 680 and 705 nm it was). I have checked other spectra with good results. To reference the reflected LED intensity is/was quite tricky; i could not repeat the result of a reflective surface. I think the board re-reflects - i thought of a non glossy black silkscreen or so.. maybe by painting some mate black on it. So to get a good reflective coefficient i think i should let the &apos;user&apos; make his own reference (100%) measurement. The transmittive coefficient works like a charm. While entering the T-Mode a automatic reference is taken from the background light. but: you shouldn&apos;t move the device after that. No problem, link this video as you wish. If you would give me the tindie ProductID of the sensor, i could put a banner of your product on my hackaday project side. - SerialOutput to SD-Card (*.txt). SerialOut gives a preformatted Table of with a stream of all values (all Channels, mode ,Voltage, temp, date, time ect...). Tindie product code is #13554, thanks. I&apos;ll post the link to the youtube video there. could this be able to know material composition? for example i want to know "how many water contain inside of banana?" Received my boards today. Took one and converted to UART so I could use the AMS tcl app. Took a while to get stuff working in my Windows7 VM however I did manage to get the vendor dashboard working. After taking some samples with my intended use-case (irradiance spectral content) it does seem clear that cosine correction will be required for my application. But still. Wow. I&apos;ve been working on a instrument to calculate the daily light integral with actual source measurements however I was always bothered that I couldn&apos;t determine the spectral content - which is actually pretty important. Well, that problem is solved. And the sensor is small enough to share the same housing with the DLI measurement photodiode. Thanks Kris! This will work with artificial sources very well - only the sun is well characterized for spectral content and everyone else just says "trust me, look at the pretty graphs we drew". What I would really like from AMS is perhaps one sensor that can give a further spectral spread in the UV portion so UVA / UVB ratio can be determined. This sensor is great - but the roll-off response approaching UVB is a little disappointing. Surely, these are important wavelengths for material identification? Many creatures that have been around longer than us ( bees, birds for example ) utilize the UV spectrum for identification of flowers and other food items. Even the standard PAR charts have been recently changed to include wavelengths past 400nm because plant biology requires those wavelengths more than had been thought. I tested the tcl code on Raspberry Pi Stretch and it worked fine. You could build a rudimentary portable spectrometer without too much effort. I believe this smart sensor suite is just the first in a series AMS is planning. I think their next offering will extend the range into the mid IR but I too hope they will contnue to extend into the UV. It is pretty remarkable what kind of performance is possible with this little device. Yes, it is not perfect as you and others point out. I am glad though that you found it easy to use. I am very pleased with how the design turned out. Please update your comments when you get more experience using the smart sensor/spectrometer. The tcl client also runs on OSX just fine but with some window size artifacts. I built a probe with a 1-meter cable out of 1/2" PVC connector and the usb-uart bridge at the end to make it stable for continuous readings. What is a spectrometer is it for ghost talking ESP? PS I believe in time travelers... I haven&apos;t stopped time yet. Thumbs up to your new and improved design for the $25 compact spectrometer! Could be useful for the available data. Yes, Ruben pointed this out a while back. Pretty nice and at about the same price point. The diffraction grating is much higher resolution and with the GUI is a very compelling tool. Just hard to integrate this into a small analysis device. @peter jansen Yes, I think this is correct, I calculated the distance for overlap of the centers as 3.2 cm, likely a longer distance would be required for complete coverage of each of the filters inside the sensors. In fact, in my penultimate log I did comment on what appears to be acceptance angle effects for two of the channels. I am still experimenting with the prototype spectrometers to see what these sensor arrays can do but I seem to be getting sensible results just pointing and measuring, which is how most hobbyists would use them. But I think you are right, that the separation between target surface and sensors will likely have to be larger, maybe 6 cm or so and the results will depend on the geometry of the setup. I think the latter can be accomodated by simply averaging (accumulating multiple spectral scans and dividing by the number) the measurements as I have been doing lately. In fact, this might be a reasonable approach for large area (~50 mm x 50 mm), more or less uniform targets: gently move the photospectrometer over the target while accumulating data. I am not sure what you mean by measurements being "incorrect". They are what they are, and there will be the need for interpretation and calibration as with all sensors. I have already demonstrated that the photospectrometer can distinguish differences in color of similar objects, and could even be used to identify different metals. I agree that we (I and any potential users of the photospectrometers) need to figure out how to use these devices to get best results. I don&apos;t agree that this is either 1) impossible or 2) will require heroic efforts. I think you still misunderstand the fundamental issue with them being on different optical paths. Imagine you only had monochrome cameras, and wanted to take a colour image. You could take a single camera and take three pictures of the same scene with three different colour filters (r, g, b), and because the images are all looking at the same thing (looking at the same direction, from the same point in space), you could use one image for the red channel, one image for the green channel, and one image for the blue channel -- and when combined in this way, you&apos;ll get a meaningful image where eveything is properly aligned. Imagine instead you chose to create a colour image by using three monochrome cameras spaced some distance apart (say 30cm), each with it&apos;s own colour filter. You take an image of something 100cm away. Each of the cameras is looking at the same scene from different angles. If you tried to stack these images, it would be a mess, and not meaningful -- it would be three different images stacked together in a strange way, rather than one measurement (the image) that you want and think that you&apos;re generating. Even worse, imagine the entire scene is illuminated by one point source light (like a single light bulb, in a dark room). The parts of the objects each camera sees are going to be differently illuminated. If you looked at the image generated from this setup, you would immediately recognize that it&apos;s incorrect and not what you thought you were doing. The analogy is almost identical here. You&apos;re not making one spectroscopic measurement of one point. You&apos;re making three different spectroscopic measurements of three different areas (that just happen to have some non-zero overlap). Merging them is a mess and not meaningful, unless your measurement scenarios meet very specific criteria, like the ones I mentioned in the last post. But because the data that you&apos;re generating from these isn&apos;t something like an image, it&apos;s not easily possible for you to look at it and immediately recognize the measurement and combination method is incorrect (like the three camera case, above). You have to use your knowledge of cameras, geometry, and measurement to work this out before hand, otherwise you&apos;ll be collecting data and not even knowing it&apos;s wrong -- one of the worst case scenarios in science (whether hobbyist or otherwise). This is not a camera, so the analogy doesn&apos;t work (at least for me). No one would expect to use this device to analyze the spectral composition of a single point (or small area) and this is not intended as a scientific instrument per se. So, with respect, I believe you are creating a straw man. The intended use is to spectrally-resolve the reflected light from an illuminated target area. I will stipulate that the device has limitations. I agree its utility is yet to be demonstrated for science or any other application. But what is your point? That it is foolish to attempt to use this device for any purpose whatsoever? "collecting data and not even knowing it&apos;s wrong"--the data cannot be wrong. Our assumptions or interpretation might be incorrect, but the proof of the pudding is in the eating. I remain convinced from my limited experience using this device that it will find many useful applications. The beauty of a $25 device is that almost anyone can afford to participate in their development. It sounds like I&apos;m not able to communicate the issues with this measurement setup and the possible resolutions in a way that you&apos;re receptive to. I&apos;d suggest reading much more about spectroscopy and the issues with making measurements from multiple sensors on different optical paths and trying to work through understanding the issues and potential solutions yourself. Best of luck. That&apos;s an exiting project. Just curious, have you looked into Luminus or Seoul LEDs for a broad-spectrum source? These are rather large; the SunLike 3 mm x 3 mm might do. "The problem with this idea is that they both have the same I2C address, so I would have had to use an I2C multiplexer." -- If you have pins to spare, go for software I2C. Paper is not a good white reference - especially since most of it will have optical brighteners (fluorescent blue to offset the normal yellow tinge). You need to get ahold of a white ceramic reference or a spectralon (sintered PTFE) reference that has been measured by a calibrated device. A colorchecker is a useful test, but still needs readings from a calibrated spectrophotometer because there are variations in batches and fading over time. Fluorescent materials also need special signal handling, since they can have "reflectance" over 100% (absorbing shorter wavelengths, emmitting at a longer wavelength, beyond the power provided by the light source). The most severe materials have around 175% reflectance signal with D65 illumination. Thanks for the feedback. Yes, my initial attempts at measuring reflectance spectra of salt (NaCl) and sugar (sucrose) with broad-band illumination have proven to be somewhat confusing. It would be helpful to me to have some idea of what these spectra should look like, but I can&apos;t find them via a simple google search. I used white paper since I had it handy. I think you are right, though, that a proper reference is required; where could I find an inexpensive white ceramic or spectralon reference? So the AS72651 is available on market, however AS72652 and AS72653 are not on stock anywhere. Where did you purchase yours? I bought mine directly from AMS, cheap too! Yes, I see they are not in stock now...Not sure when they will be back. Hell if you&apos;re selling these on Tinder, I&apos;m in - I&apos;ll have one! I acknowledge it probably won&apos;t be at $25, still, exciting! edit - I feel too that this&apos;ll really be interesting to explore with some Google Deep learning code thrown in for good measure, although the method for measurement would need to be nailed down, this is a perfect kind of &apos;input&apos; into a neural network - with human input (for the time being) to provide it what it is it&apos;s looking at. I think for any kind of serious (or semi-serious) work the spectrometer will have to be held in a fixture and the sample will have to be held in a reproducible way so proper background subtraction and intensity scaling would be possible. The small size will help here. Hand held, it is a lot of fun to look at spectra of common objects, but for material identification (my application interest) a little more care will be required. Yeah, that&apos;s pretty cool! It has better perfromance specs (3 nm resolution), similar frequency range, and is just as easy to use. Maybe this spectrometer is a better candidate for the Hackaday prize! AMS&apos;s offering of the small multi-channel spectral sensors is interesting, but it&apos;s not clear to me how the group of three sensors would be useful for most applications in practice -- their apertures are each on a different optical path, so you would either have to precisely move the sample several times to complete a measurement of the same area, or be measuring something so large with a flat field (I&apos;m not sure what that would be) that it was uniform over the different optical paths, or put some optics in front to split the light (which is likely going to increase cost, and decrease signal). The Hamamatsu microspectrometers are a bit more, but they&apos;re beautiful instruments, have a wide spectral range, and don&apos;t have these issues. I am not sure how this is going to work in practice yet. The YouTube demo uses rather large area samples, so this will not be useful as a spectrum-resolving microscope to be sure. The optimal arrangment of the sensors and their illumination source(s) as well as the utility of the spectrometer is TBD (goal of this project in fact). I expect the spectrometer will be useful to (as the datasheet says) identify composition of common materials, authenticity of certain materials (money, metals, etc), ripeness of fruits, agricultural health diagnostics, and maybe limited medical diagnostics. What makes this solution special is the very low cost; so low that the spectrometer can be considered disposable. The Hamamatsu spectrometers are not a bit more, they are at least an order of magnitude more expensive and need sophisticated circuitry to obtain and interpret the data. The AS7265X doesn&apos;t even need an MCU, just an FTDI connector and a pc. These "instruments" are in different classes and not meant to compete necessarily. 18 channels at 20 nm FWHM per channel spanning 410 - 940 nm for $25--an astounding bargain whose utility will simply have to be demonstrated in use. The main issue is that it&apos;s not an 18 channel spectrometer, but 3 physically separate 6 channel spectrometers, and that substantially complicates almost every measurement scenario I can think of. I&apos;m also not sure what kind of (for example) generic material composition identification could be done with (in the very best case) an 18-channel 20NM FWHM visible spectrometer. I&apos;m eager for someone to find some good use cases for these inexpensive devices, but the combination of the measurement difficulties and the application scenarios make this (I think) quite challenging. Given I would want this lens over all the sensors - I will not be using on-board LED sources. An astounding value. More demanding users may need to invest to obtain characteristics they desire. I wonder if you can hack a fiber coupling to these less expensive parts. I could envision a bundle of narrow fibers split 3 ways to illuminate each sensor. The common end would gather light from the sample and deliver some to each device. I&apos;m sure the devil is in the details, but it might be worth a try. Well, on the one hand I am embarrassed that this project made it into the Hackaday Prize finals since it is simply reproducing a reference design from the data sheet and getting it to work. I have done this dozens of times for more complicated (but better documented) sensors. Now it seems it will actually be a challenge to get useful results from the "spectrometer". I don&apos;t share your assessment. Unless I made a math error, the 12-mm separation of the three spectrometer ports in the current design and 41 degree acceptance angle means that a 1 cm diameter object is fully covered by all three spectral elements at a distance of 3.2 cm. This requires no special optics or alignment, etc to work. This 3-element spectrometer seems eminently practical to me. Is there really a significant difference between the AMS and Hamamatsu solutions in terms of performance? Sorry Kris, I&apos;m just seeing this. Here&apos;s a diagram that shows the sensor field of views assuming a 41 degree FOV, and 12mm spacing, for a flat imaging plane 3.2mcm away ( http://www.tricorderproject.org/blog/wp-content/uploads/2018/07/ams_grid1-1.jpg ). The fields of view only have some spatial overlap, so they&apos;re measuring different parts of the sample -- and worse, this changes depending on the distance (and, unless you have the sample flatly illuminated, then there&apos;s likely also a non-uniform brightness confound in the data). 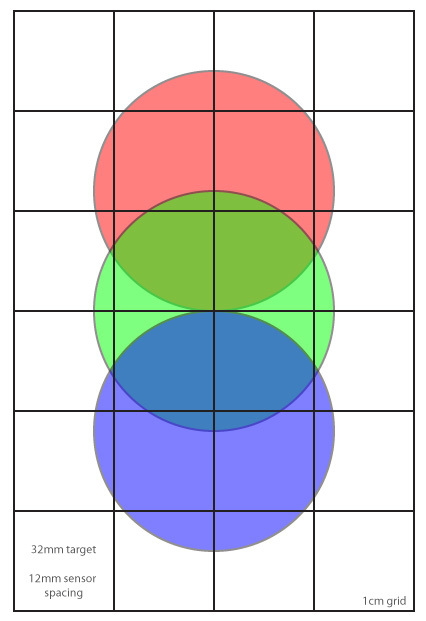 In order for the measurements from something like this to be meaningful, the three circles would have to be overlapping, and the illumination would have to be uniform -- i.e., they&apos;d be on the same optical path. There are special cases where you might be able to use it, for example cases where you can guarantee (a) the single material you&apos;re sampling is uniform over the entire area (about 25x50mm @ 3.2cm distance) and (b) uniformly lit. Similarly, you could build a large matte black absorptive box around it, with a flat piece (say) 40mm away from the sensors, and make a small 1mm hole right in the center of the intersecting fields of view -- then press the sample against the hole and illuminate the sample from the front (reflective, or, ideally back, for absorptive measurements). But if you&apos;re just pointing this 3-sensor device around without considering that the sensors are on entirely different optical paths, then I&apos;m fairly certain all your measurements will be incorrect except in very special cases, like the ones I mentioned above. Thanks, now I am thinking of adding a mid-IR sensor as well, like the Hamamatsu C14272 for additional organic molecule ID. The price is ~10x higher for that one. You project is really amazing. I wanted to build a lamp made of several kind of light sources in order to have a light spectrum very close to real light. The first problem I met was to measure the spectrum. This project could totally help, so good luck with it ! I think there are sun light leds available that mimic the suns output in the visible. But yes, it is great to have a convenient way to measure. Do you think this is the same multichannel board that you got? I might get one. Yes, that&apos;s it. Looks like for a lot less than I paid too! Just got mine. What LEDs did you got? It really needs a light source. I am using a Luxeon ZES 5700 K 90 board band source but I haven&apos;t checked what kind of performance this gives yet. Life-changing circumstances led me to begin having Nightmares in which I would wake up finding my pillow soaking wet, and vivid memories it. You are about to report the project "Compact, $25 spectrometer", please tell us the reason.